I am Lee Yunseok, creator of YGGDRASIL STUDIO. We've participated in the Humble Store Spring Sale 2017! Grab Discouraged Workers TEEN with 50% off! Ends May 25th at 10AM Pacific Time! As a hospital coordinator, Ga-yeon fell in love with a doctor at the hospital she was working in and they had an affair even though the doctor was a married man. When the director found out, she was fired. For over a year she tried to find another job, but her mental uneasiness eventually made her give up and she became a recluse. A year later, in the spring of 2013, her younger sister, Hye-na, and her first love Yunwoo come to her. A story about the dark side of today’s youth and serious life events happening around Ga-yeon. This is a TEEN version of the Discouraged Workers, takes the form of kinetic novel(visual novel similar). The game will be moved on mostly through Ga-yeon’s point of view and the Archives will be also helpful for you to understand the whole play. Basically you don’t need to be directly involved in the game – just watch, read, listen, and feel it. However sometimes, you may be required to do something to collect some records or scenes. Discouraged Workers is played automatically. You can toggle this function. A Korean-based densely-plotted story with the gloomy theme. The short but intense 100+ minutes, with the real soap opera-like directing. The animation-style sprites & CGs, and backgrounds based on retouched real pictures. Archives contains 60+ records(Characters and Concept, Diary, Gallery, and Music). Records are granted in accordance with the progress of the game. Steam Achievements, Steam Trading Cards series unlike the original version, cross-platform auto-cloud sync with Steam Cloud. Full Controller Support, native Steam Controller support. Contains soundtrack for the Steam Music Player, Android build, PDF Manual. Very first native Steam Controller support in Korea, Republic of. 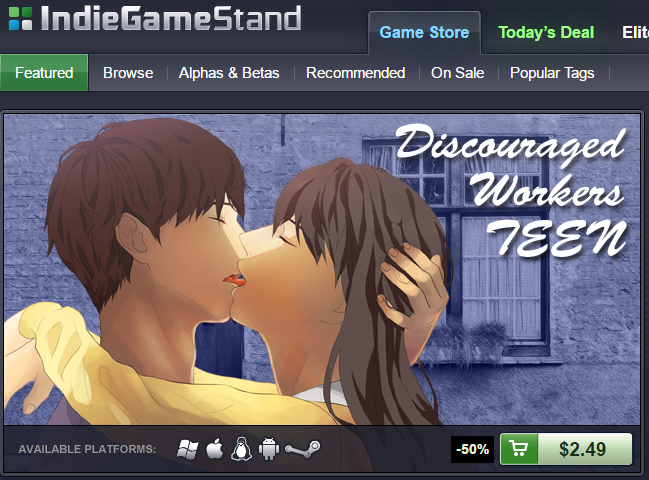 And now it's featured on the IndieGameStand! Unfortunately, the original version was not released to the Humble Store. But we have a Humble Widget, so you can buy the original in here! Our remake work is still ongoing! Once we have done, you can play the remake version through the update! Hope you like it!